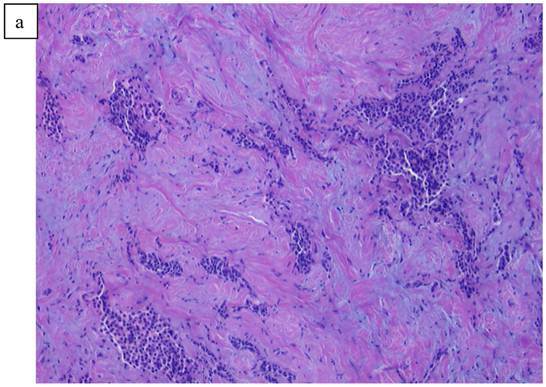 We report on the development of an uncommon association of pathologic processes, where an invasive adenocarcinoma of the breast developed concomitantly with a primary lymphoma arising in the same breast. The patient, a 78 year old female, presented with two palpable breast lesions in her left breast and an additional lesion in the right breast. Core needle biopsies of the lesions revealed both ductal carcinoma and lymphoma existing adjacent to each other in the left breast and a second primary lymphoma in her right breast. The mammogram, which also defined the lesions, illustrated collision tumors of the left breast and a separate pathologic process in the right breast. Excision of the lesions confirmed the two independent lesions on the left side, one an infiltrating ductal carcinoma and the second a large B-cell lymphoma. Biopsy of the right breast also demonstrated existence of a large B-cell lymphoma. Left axillary biopsy using sentinel node technology indicated that there was no evidence of nodal metastasis. The question arose as to possible etiologic factors related to viral transfection at the DNA level, that could cause transformation within the ductal epithelium of the breast with similar transfection of the lymphocytes of an adjacent intramammary node, that led to the development of the simultaneous pathologic processes of ductal carcinoma and B-cell lymphoma, defined on biopsy. A 78 year old female presented to her primary care physician with a palpable lesion noted in her left breast, questionable axillary nodes and a second lesion in her right breast. The patient had no prior history of any medical or surgical illnesses and was not on any medication. A mammogram taken of both breasts revealed approximating lesions in the left breast (Fig. 1) and a single lesion in the right breast. In Figure 1, we are able to discern two discrete lesions of the left breast the nature of which were defined by core biopsy. The initial core biopsies of all three lesions were performed in the mammography department of North Shore Univ Hospital. The right breast proved to have a solitary lesion demonstrating predominantly lymphocytic pathology consistent with a B cell lymphoma. In the left breast 2 separate pathologic processes were defined, one an infiltrating ductal carcinoma (Fig. 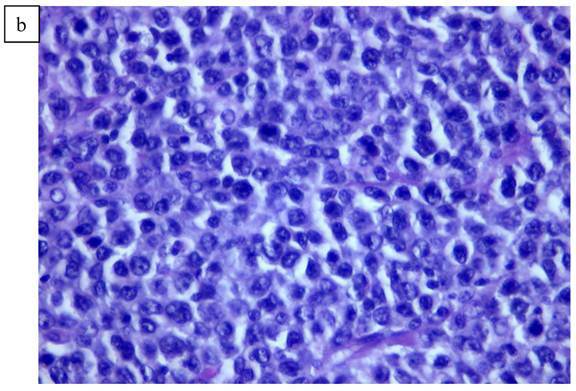 2a, 2b) and in close proximity, a second lesion, the B-cell lymphoma (Fig 3a, 3b). No further surgery was performed on the right breast. The left breast underwent partial mastectomy. Nodes that were sampled from the left axilla were all negative. Demonstrates localization of two lesions of the left breast for biopsy. a). Poorly differentiated ductal Carcinoma obtained from a biopsy of the left breast carcinoma. b). High power view of the invasive ductal carcinoma obtained from the left breast x20. a). Lymphoid pattern of the second lesion found in the left breast. b). Large B cell Lymphoma well defined on higher magnification x40. The initial core biopsies followed by the surgically resected specimens taken from the left breast were subjected to routine H&E as well as immunohistochemical staining. PCR of tumor samples taken from the left breast were performed suggesting that the presence of a sequence derived MMTV was present in the specimen. PET scan taken shortly after surgery, failed to demonstrate any evidence of distant pathology. The patient was seen 3 months later in follow up with the new finding of a mass on her back and swelling in the right popliteal space. Excisional biopsies of both new sites were performed. 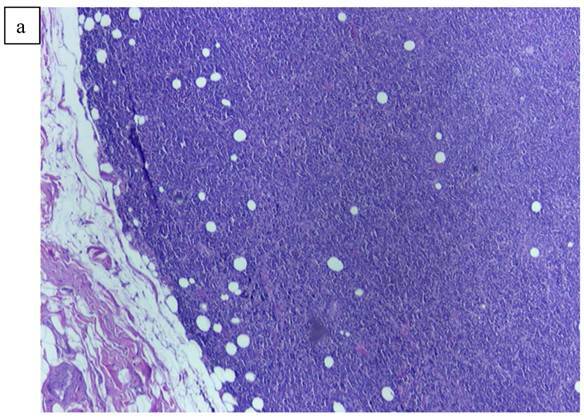 Each of the lesions proved to be consistent with B-cell lymphoma. Pathologic evaluation of the submitted breast specimens revealed that the left breast contained the two discrete, but closely adjacent lesions measuring approximately 0.9 cm in diameter. Microscopically there were determined to be both infiltrating ductal carcinoma in one and large B-cell lymphoma of follicular cell origin in the second specimen. The right breast, back lesion and popliteal mass all presented with the histologic pattern of malignant B-cell lymphoma. 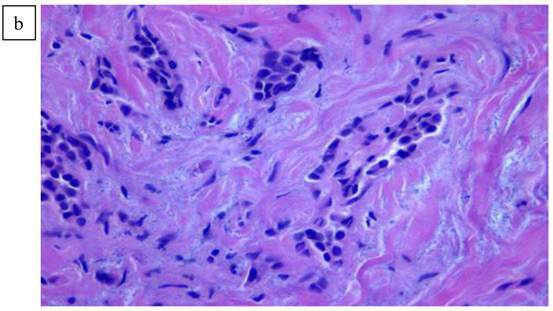 Immunohistochemical studies revealed that the ductal carcinoma was ER+/PR+ and Her-2 negative. The lymphoma contained medium to large monoclonal B cells positive for CD45, CD19, CD20, CD10, BCL-2, BCL-6 kappa+/lambda-. The lymphomatous lesions were all negative for CD5, CD10, and CD23. Based on these findings the patient was not offered therapy for the adenocarcinoma but was started immediately on CHOPP chemotherapy and Rituxan. These medications have kept the lymphoma under control and no evidence of recurrence of or a new breast primary has been seen. Primary lymphoma of the breast is a well-known, albeit an uncommon form of breast cancer comprising only 0.04 to 0.5% of primary breast malignancies (3,4,5). For the most part it arises within intramammary lymphoid tissue (6). The association of lymphoma and carcinoma co-existing in the same breast is less frequently seen (7). From an etiologic cause and relationship however, it is well known that the MMTV virus in particular, has a strong association with breast malignancy (8) and is beginning to be recognized as a potential etiologic factor in lymphoma and prostate cancer as well (9,10). Lymphocytes and in particular B cells, express the Wnt-1 gene which serve to increase phosphorylation of B-catenin within the cytoplasm of the lymphocyte. As one finds in those cells lining the breast duct system, and in particular their precursor stem cells (11,12), transfection of the Wnt-1 gene in the ductal cells occurs via a viral fragment from the long terminal repeat (LTR) of the virus. This viral fragment enters the duct lining in a similar fashion to that in which the lymphocyte is transfected. Over expression of Wnt-1 occurs in both instances and leads to the development of ductal carcinoma as well as lymphoma (13). In the case presented here, we believe that viral involvement of the glandular element of her breast tissue (probably via stem cells) synchronously effected the adjacent intramammary lymph tissue to result in the clinical findings noted. When the MMTV virus does transfect breast epithelial tissue, it appears that this virus frequently involves, as mentioned above, the Wnt-1 gene. The effect of such a gene modification results in modulation and as such, over expression of B-catenin within the breast cell as well as lymphocyte that may be present within the intramammary tissue. A similar association has been noted in prostate cancer where over-expression of B-catenin is also related to the viral transfection of prostate cells by the MMTV virus. The Wnt-1 gene in these instances enhances phosphorylation of B-catenin to increase its activity. B-catenin serves in almost all cases as both as a cadherin as well as transcriptional protein. Bittner (14) had originally suggested and then demonstrated at a later date, that a virus was responsible for the development of breast cancer in the experimental mouse model. It is now commonly accepted that a similar phenomenon occurs in human breast cancer. It has also been suggested that while DNA transfection occurs for the most part from exogenous viral sequences arising in the mus domesticus, that in rare events, endogenous sequences related to the MMTV may be passed from generation to generation. A sequence homologous to a segment of the MMTV envelop gene (15), can be defined in 38% of patients with cancer of the breast. Whether it is the MMTV virus alone or this virus in association with another such as the EBV virus (16,17) is under consideration. The EBV virus does contain a homologous sequence to FGARAT which acts as a transcriptional protein in many high grade human malignancies. It also serves to over express the enzyme telomerase which is essential for the prolongation in survival of the cancer cell. The MMTV virus additionally contains hormone responsive elements which may account for the virulence of breast cancer in pregnancy and lactation (18). 61% of breast cancers developing during pregnancy and subsequent lactation contain the envelop sequence for the MMTV virus (19). Human isolates also contain superantigen sequences which are functional and may contribute to the pathogenesis of the malignancy (20). Stewart (21) suggested that the viral carrier for MMTV was a particular strain of mouse, the mus domesticus. This species is found to occupy a narrow swath through central Europe and where breast cancer is seen to develop most frequently. This species of mouse had expanded across the Atlantic, after the Black Plague, originally appearing in England and then spreading to the New World, represented by the Americas and then on to Australia. During the well-known mouse plagues which appear periodically in Australia and wherein observers describe the mountain sides near the wheat fields being harvested, as covered by millions of the mice, the incidence of breast cancer can be shown to significantly increase. This incidence of clinical disease does however revert to the normal incidence of 1 in 7 patients when the plague has resolved. Several reports have appeared illustrating the high association of breast cancer with subsequent lymphoma developing systemically (22). There have, in addition, been several situations reported where the association of the two pathologic processes has appeared in the same breast synchronously. One could define the presence of a sequence from the long terminal repeat of the MMTV strain by PCR in breast samples from ductal carcinoma arising in the breast tissue as well as in lymphomatous tissue from intramammary nodes. One of the questions arising from the finding of various stages of transformation seen during growth of the malignancy is which particular population of cells is involved in the mutagenic process (23). Here, one of the prevailing concepts suggests that in many instances, stem cells may have migrated to breast tissue involved in the malignancy and may be the instigators of the malignant phenotypic process. Evidence for the presence of stem cells in normal mammary tissue has been demonstrated. These cells, which rarely divide, persist throughout the reproductive life of the patient. They can be identified by radiolabeling cells in the breast tissue samples taken for the expression of the stem cell antigen Sca-1, CD24 heat stable antigen, and CD-29 B-antigen. Those cells expressing the antigen arrays, appear to have the capability for expanded differentiation and colony formation. In the mammary gland tissue of MMTV infected transgenic mice, the CD29, CD24 population of cells are increased and mammary cell outgrowth becomes markedly hyperplastic in appearance suggesting that genotypic transformation has occurred. There are also reports that the transgenes encoding components of the Wnt signaling pathway preferentially induce mammary cancers from such progenitor stem cells. This further implicates MMTV and its association with the presence of stem cells which act as the initiator of breast malignancy (YiLi, Welm B, Podsypanina K et. al.) (24). Expression of the Wnt-1 proto-oncogene in mammary glands of transgenic mice result in an expansion of a population of epithelial cells which express the progenitor cell markers, keratin 6 and Sca-1. Subsequently, developing tumors express these markers and contain luminal epithelial and myoepithelial tumor cells that share a secondary mutation, the loss of PTEN. This further implies that they arose from a common progenitor. The presence of stem or progenitor cell markers in mammary tumors, as noted above, suggests that breast malignancies arise from immature cells. Two genes, keratin 6 and stem cell antigen (Sca-1) appear to be preferentially expressed in mammary stem and or progenitor cells (22). Keratin 6 is expressed in mammary gland analage at around embryonic day 16. Sca-1, encoded by Ly-6A/E is a GPI linked protein that is also found in hematopoietic stem cells. Depletion of these cells results in a loss of functional stem cells in mammary gland reconstitution experiments. Sca-1 is not observed after cells have further differentiated to express the progesterone receptor. Bittner (1,2,3) had originally suggested and then demonstrated that a virus carried by mouse was responsible for the development of breast cancer in mice. Information is now commonly accepted that a sequence homolgous to a unique segment of the MMTV envelop gene can be defined in 38% of patients with cancer of the breast (24). The MMTV virus contains hormone responsive elements which may account for the virulence of breast cancer in pregnancy and lactation. 61% of breast cancers developing during pregnancy and lactation contain the envelop sequence for the virus. Human isolates also contain super antigen sequences which are functional and may contribute to pathogenesis of the malignancy. Stewart (21) suggested that the viral carrier was a strain of mouse, the mus domesticus, which occupies a narrow swath through central Europe and where breast cancer is seen to develop most frequently. This species expanded across the Atlantic, originally from England and then to the New World represented by the Americas and then on to Australia. During the well-known mouse plagues which appear periodically in Australia and wherein observers define the mountain sides as covered by millions of the mice, the incidence of breast cancer can be shown to increase, only to revert to the common incidence of 1 in 7 patients when the plague has resolved. Upregulation of SMYD3 (25), a histone H3 Lysine 4 specific methyl transferanse, which plays a key role in the proliferation of colorectal cancer is also elevated in the majority of breast cancer cells. Silencing of SMYD3 by small iRNA molecules directed against the gene was found to inhibit the growth of breast cancer cells. SMYD3 also promotes the development of breast carcinogenesis by directly regulating the expression the proto-oncogene WNT 10B. The leader peptide (p14) of the Env-precursor of the MMTV is translocated in to the nucleoli of the murine T cell lymphomas that harbor the virus. P14 is also localized to the nucleoli of mammary carcinomas and some human breast cancer tissue specimens that have been studied. These findings further suggest that there is an association between the development of lymphoma and mammary carcinoma. Mouse mammary tumor virus like sequences have been found in up to 40% of breast cancer samples (26, 27). 32% (43 0f 136) female breast cancer samples were positive for MMTV like sequences when screened by PCR. Grade 1 tumors had 34% incidence and grade 3 a 38% incidence. MMTV sequences were found in 62 (8 of 13) male breast cancer samples and 10 of 52 (19%) of male gynecomastia. Both MMTV and the putative human homolog of the virus have been shown to have hormone responsive elements in the long terminal repeat regions of their genomes suggest that for the induction of breast carcinogenesis an infection via the virus, hormone activity and genetic elements combine to initiate transformation to malignancy. Primary lymphoma of the breast constitutes 0.04% - 0.05% of breast neoplasms and 1.7% of all extranodal NHL (28,29,30). Its rarity is probably related to the small amount of lymphoid tissue in the breast. Responding to combined therapy for intermediate grade lymphoma. MMTV is a B type retrovirus wherein infection allows viral RNA to be released into the cells with additional proteins allowing for viral replication. After release of the RNA, the reverse transcriptase makes a DNA copy which can be inserted into the cellular DNA such as WNT-1. Many of these viruses become endogenous to the genome and then can be passed to the offspring. In mice with endogenous viral DNA and the incidence of the malignancy increases. There may be both exogenous and endogenous homolog's of HMTV, Holland and Pogo (2,15). Gary (15), as noted above, also discovered a retrovirus which was more than 95% homologous in structure to MMTV but which remains endogenous in humans. He had also shown that HMTV sequences can be identified in about 90% of human breast cancer patients. The possible causative viruses related to most human malignancies and in particular breast cancer are B type retroviruses (31,32). The genome of these retroviruses is composed of RNA which when released into the cell along with a secondary protein/enzyme, the reverse transcriptase, conversion to DNA occurs. This DNA copy is inserted in an at random fashion into the DNA of the infected cell. These viral sequences then direct expression of the viral genome where in response to estrogen, a complete RNA copy of the viral genome is produced. Sometimes an at random insertion occurs within an area of the DNA base pairing that results in alteration of the gene function. These series of mutations, almost all arising from transfection with the MMTV retrovirus, allows progressive transformation leading to the clinical development of breast cancer and the occasional case of breast lymphoma.